Looking for a credible company to handle your garage door repairs or installations in Oldsmar FL? We know the importance of having a garage door that works. When it develops problems, that faulty garage door can compromise the safety of your family or leave your properties at the mercy of Mother Nature. BP Garage Doors has been in business for over 20 years and offers full-on garage door repairs and installation services. Do you need your garage door replaced? Did a spring come off the track? Did you mistakenly back into your garage door? Or are you just looking to upgrade your home with an intention to sell in the near future? Don’t worry, we have all those bases covered and that’s just a start. 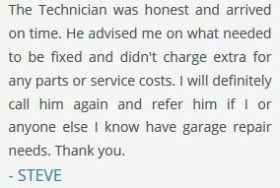 Our garage door technicians are the cream of the crop. 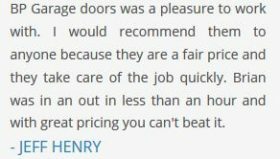 They are well-trained and experienced when it comes to repairing or installing all types of garage doors available on the market­ –whether traditional or contemporary. All our garage doors are high-quality and inasmuch as they increase the visual expression of any home, they do not overwhelm the appearance of the house as a whole. BG Garage Doors offer same day services to customers without compromising on quality. We remain one of the most trusted names in the Oldsmar area when it comes to the garage door business. When we arrive to sort out your issues, we do not leave until we find a permanent solution to the problem. We handle all problems ourselves and do not outsource like other companies do. You will be saving plenty of time and money by working with us. Come rain or shine, we are there. Once you put a call to us and book an appointment, our friendly technicians are on your property, in a matter of minutes. Our technicians determine the door diagnostics and get straight to work, once the go-ahead has been given. Our clients are always in the loop of how long the project will take and cost. Nothing is insignificant when it comes to working with us. We give the same amount of energy and detail to everything that we touch and make it right. So it is no problem, if you hear your garage door just making a creaking sound, when you close or open the door. Our team can take care of that too. BP Garage Doors is located right here in Oldsmar. This means that we can quickly attend to whatever issues you might have. Our team works flexible hours and is available all day and all night. Even when our services are required after traditional work hours, we are available. We do not charge any additional fees for this exceptional service. Get superlative quality and unmatched value all balled up in one when you saddle us with your garage door concerns in Oldsmar FL. Call us at 727-224-7599, if you require our services. You will not be disappointed.